Fr. Wolfgang Seitz, ORC:Fr. 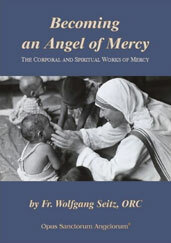 Seitz explains with profound insight and great inspirational stories how to grow in the fourteen spiritual and corporal works of mercy so that we ourselves become angels of mercy to others in imitation of Our Lord and our Guardian Angels. The constant living of the Works of Mercy become the program of our lives!